5 for Friday: Getting Ready to Tackle the Hat! Every once in a while, I come to a crossroad. Do I go left or right? Up or down? Through or around? Anyhow, I am at one of those professionally. Do I continue doing what I am doing or do I search for something that is more enriching? What I am doing now pays well and what I would like to do, does not pay much. So what does one do? Well, in my case, I switch roads and think about it – while RUNNING! This week was about my return to running after a week off. I am battling a few nagging injuries and the hope was I would heal with some rest. Did it work? Sort of. Now I strangely have another injury so I think a visit with the PT could be in my future! All the pain is on my left leg – the right leg has no pains! With that said, my grandfather once said to me that one only feels pain in one part of their body at a time! Now onto this week’s 5! NUMBER ONE: Getting Ready for the Hat Trick! Well the Runners World Classic is coming up quickly and I am prepping for the “Hat Trick” which is a 5k, 10k and a half marathon. The body is wavering but the mind is ready so let’s hope that the body gets better and I crush it! 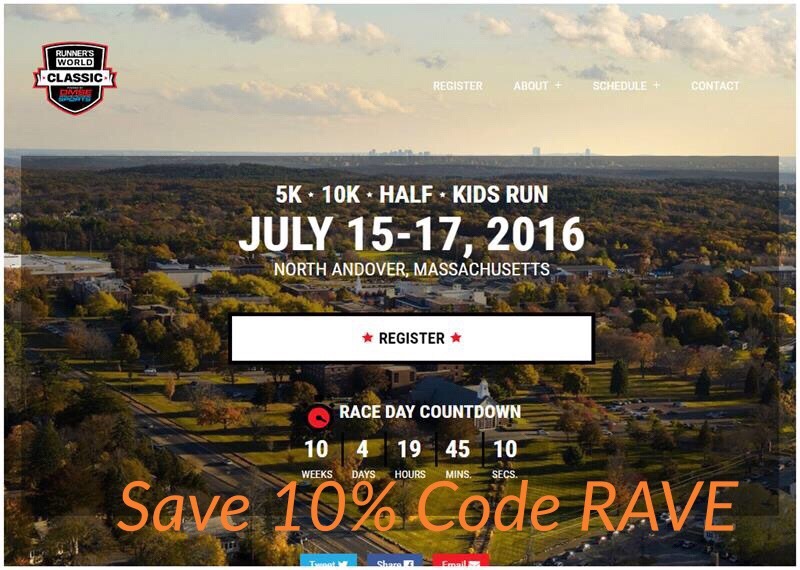 Also if you are looking to run this race, why not save 10%! Code is above. NUMBER TWO: Americana Run with FitFam! So I signed up for a set of virtual races with FitFam and the first one is the “Americana.” I ran a 10k for this race and completed it this morning in slightly over 50 minutes. This was not a PR as the Rye Harbor race saw a sub 50 minute run. It is interesting that I was really focused this morning to do well for this “virtual race.” Never thought that would happen after questioning them a few months ago! NUMBER THREE: Evaluating Running Gear As a BibRavePro, I get opportunities to try new products. The Luvo and Aftershokz were two that I have tested and have written about. I am running the RW Classic, mentioned above as well. The question is though…do I need all of this gear? I am a “simple” guy and all this other things that are out there like water bottle holders, endurance packs, etc just seem to be overkill. Perhaps I am wrong and perhaps I need to become more complex! NUMBER FOUR: All about Presence! So one of my goals is to build up my Instagram presence. I have 150 followers and want to get that number up to at least 1000 in three months! So come join me at @bmacrunning! My goal is to educate others that even if one has a disease, that should not keep them from continuing to live life. Fight through walls and stay positive. I have more to share on this topic some coke join me for the ride! NUMBER FIVE: Reach the Beach only 3 months away! I am particularly excited about the RTBRelay that the #Guzmanguys will be running in September. This will be my second time doing this with the guys and we hope to continue to improve on our times of the past few years! I will post on Twitter while on the route so you can all hear about our progress! Well, that is it. Normally next I would post the pics from my runs but the WordPress app is acting up and I cannot seem to load the pics. I will attempt to remedy this over the weekend! Next Post Happy 4th of July Everyone!